Workbenches with screw-driven vises are a fairly modern invention. For more than 2,000 years, woodworkers built complex and beautiful pieces of furniture using simpler benches that relied on pegs, wedges and the human body to grip the work. While it’s easy to dismiss these ancient benches as obsolete, they are – at most – misunderstood. For the last three years, Christopher Schwarz has been building these ancient workbenches and putting them to work in his shop to build all manner of furniture. Absent any surviving ancient instruction manuals for these benches, Schwarz relied on hundreds of historical paintings of these benches for clues as to how they worked. Then he replicated the devices and techniques shown in the paintings to see how (or if) they worked. This book is about this journey into the past and takes the reader from Pompeii, which features the oldest image of a Western bench, to a Roman fort in Germany to inspect the oldest surviving workbench and finally to his shop in Kentucky, where he recreated three historical workbenches and dozens of early jigs. 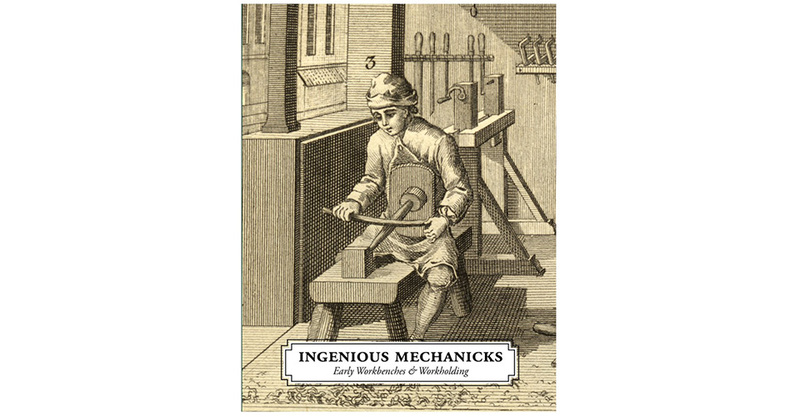 Even if you have no plans to build an early workbench, “Ingenious Mechanicks” is filled with newly rediscovered ideas you can put to work on your modern bench. You can make an incredibly versatile shaving station for your bench using four small pieces of wood. You can create a hard-gripping face vise with a notch and some softwood wedges. You can make the best planing stop ever with a stick of oak and some rusty nails. Lost Art Press, 2018. Hardcover, 160 pages. Printed and bound in the USA.